Margot Robbie hosted the premiere of the 42nd season of Saturday Night Live this weekend, and she showed that she can be charming and hilarious doing live comedy – which can be a lot tougher to nail than film. When she wasn’t impersonating Ivanka Trump in a Family Feud sketch, she was killing it in her opening monologue. Robbie began her monologue by saying it was fun to be in America for the election (truly a phrase you’d only hear from a citizen of a country other than the U.S.). She then alluded to the frequency with which politicians lie, alluding to the numerous fact-checkers during last week’s first presidential debate. Robbie then mentioned her film Suicide Squad, which smashed box office records and exceeded expectations to become one of the summer’s most successful films. Talking about the film, Robbie brought up Jared Leto, who played the Joker to her Harley Quinn. “Jared Leto stayed in character like the whole time, which was so, so fun,” she shared. We’ve heard a lot about Leto’s off-screen antics, and Robbie wasn’t the only one who was made uncomfortable by them – Viola Davis has said she suffered heart palpitations during filming. While Leto has defended his actions as the way he got into character, we applaud Robbie for being honest about how she felt – actors might have unconventional jobs, but they still deserve to feel safe coming to work. 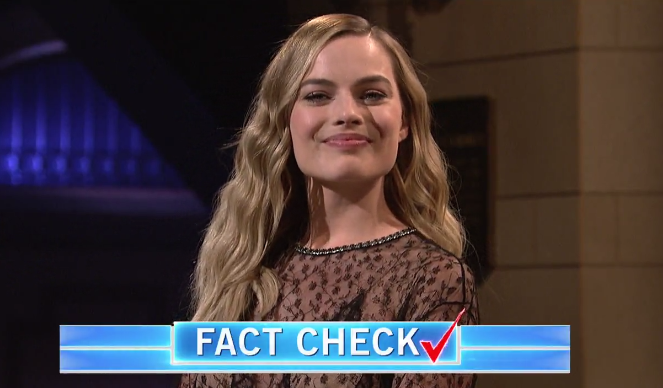 Robbie’s monologue continued with SNL cast members joining her individually to fact-check themselves, and it was a hilarious start to the season.